Posted on July 22, 2011	by Lou Murray, Ph.D. 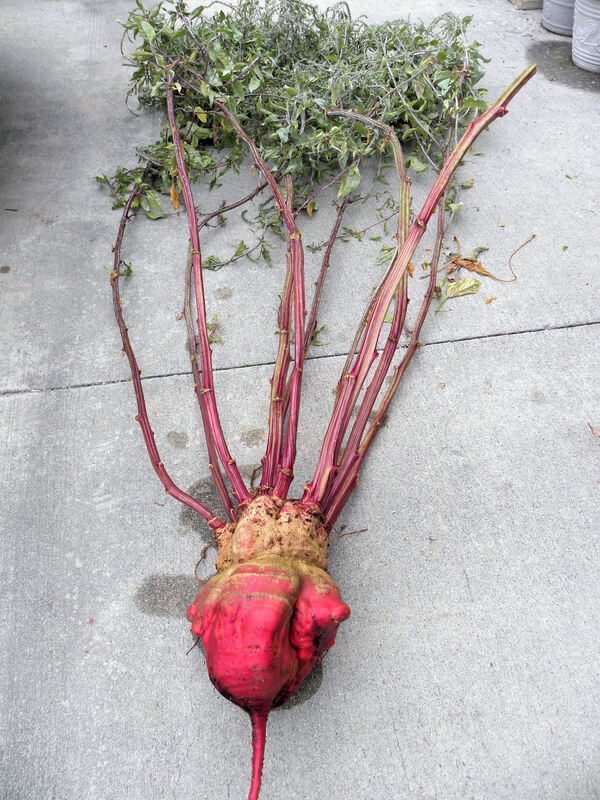 I won second place in the giant beet category last year at the Orange County Fair. 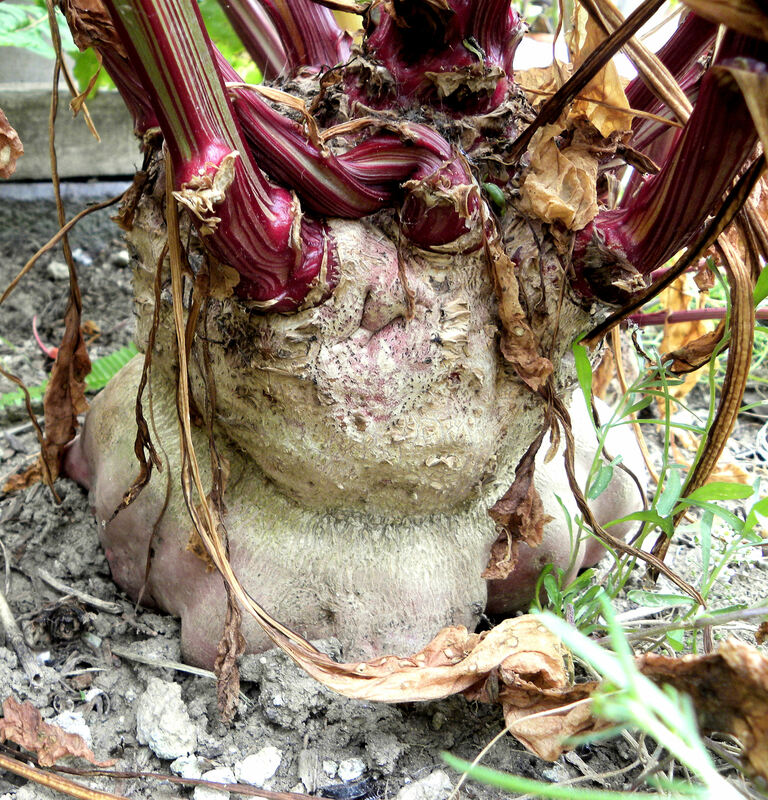 That was so much fun, that I attempted to grow more giant beets for this year. It’s pretty easy. Just leave them in the ground to overwinter and they get huge and gnarly the second summer. Well, sometimes they do. I had one this year that was a contender, and I harvested it for opening week of the fair. There is a new produce competition every week. There was no telling how big it was underground, but it measured 24 inches in circumference above ground. This had to be a winner. We had trouble fitting this monster into my SUV. We tried several arrangements before we finally got it all in. Once at the fair, I carried it over my shoulder like a load of lumber. I could hardly wait to see how it did at the judging. The next day, Friday July 15, was opening day at the fair. I went with my friends to see how my beet fared. 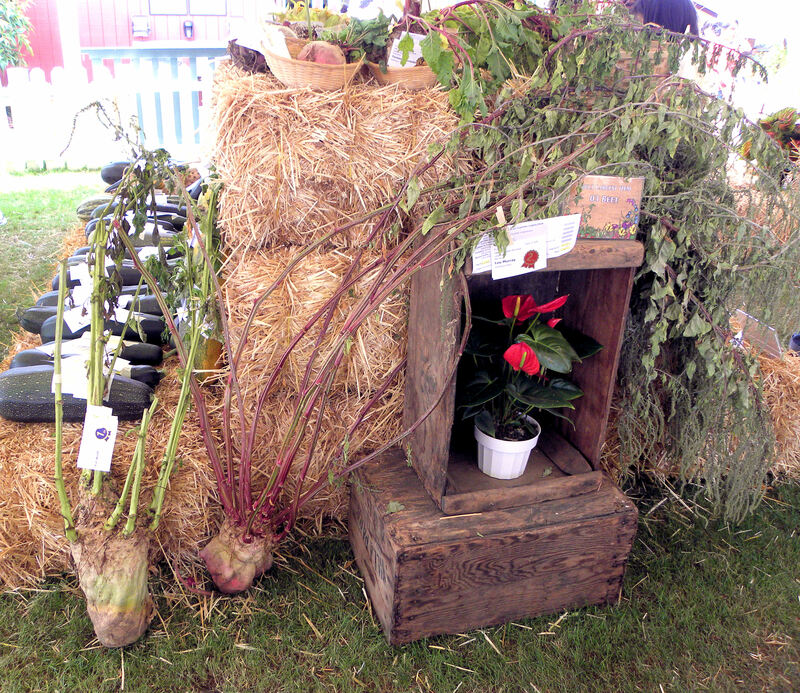 Gargantua, the beet to the left of the wooden box, is dwarfed by the giant beet next to it, a sugar beet grown by Pat Wolff of Huntington Beach. So I won second place again this year. 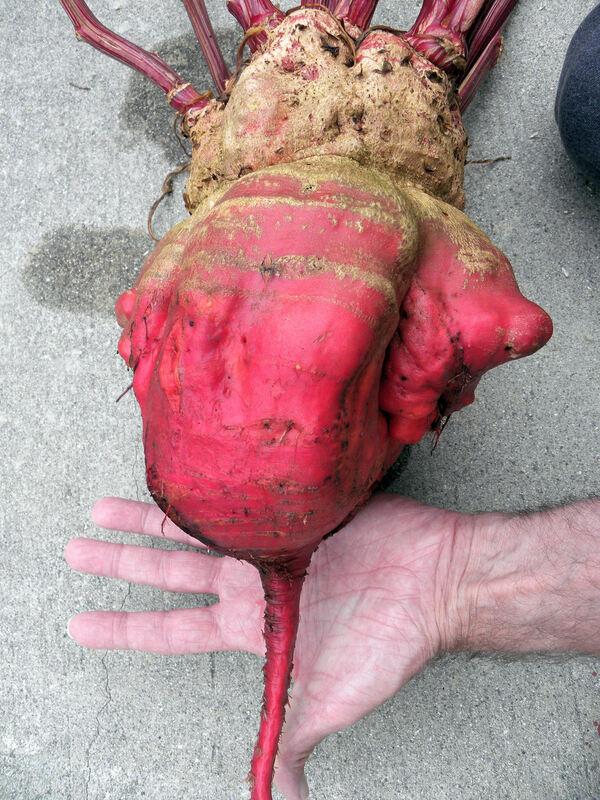 No way a Chioggia beet is ever going to get as big as a sugar beet. I guess that’s what you have to grow if you want to win first place in the giant beet competition. I also entered some of my Texas sweet red onions. My red onions took third prize at the county fair. 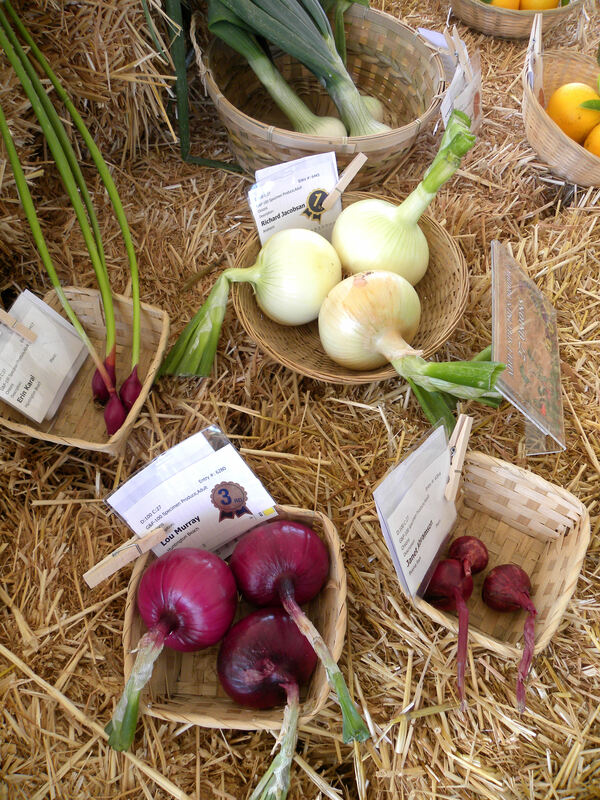 Two other baskets of onions were clearly superior to mine, and I took third place in the onion category. I searched my garden for anything that might be worthy of the fair this week, as there is a new contest each week for the month that the fair goes on. I only have two cucumbers, and neither Stumpy nor Curly the cucumbers are fair quality. The rats ate my green beans and the wax beans are finished. However, I had a perfect pie pumpkin growing in my home garden. I grew it on a trellis so it would have a perfect shape. It had turned orange in time, so I harvested it and entered it along with three Meyer lemons and some medium-sized chard leaves. I checked the competition before leaving the fairgrounds on Tuesday. There were 22 entries in lemons, so mine don’t have a chance. There were 8 pumpkins entered and mine was the smallest one there. Mine was perfectly shaped and as beautiful a pie pumpkin as you could ask for. However, I’m sure that the magnificent Queensland Blue pumpkin will win, and probably two Connecticut field pumpkins that are double the size of my pie pumpkin. Size matters in pumpkins, even if it isn’t a giant category. Again, I don’t have a chance. But I was the only person who entered chard, so I should get a blue ribbon. I guess the strategy is to find a category that is lightly entered if you want to win. Hey, it’s all fun. Check out my Natural Perspectives column in this week’s Huntington Beach Independent to read more about the fair. This entry was posted in Uncategorized and tagged contest, giant beet, Huntington Beach Independent, Orange County Fair, pumpkin, red onions, sugar beet. Bookmark the permalink. Congrats on second place. That is one huge beet.